There are lots of ways to recycle old newspapers—you can use them to wrap a gift, line your bird cage, or build the walls of a house. The latter is what Elis F. Stenmen did when he began constructing the frame of his summer home in 1922. As a hobby, the mechanical engineer—whose day job was designing machines that made paper clips—decided to build the walls of his Rockport, Massachusetts house from newspaper. With help from friends and family, Stenmen collected approximately 100,000 newspapers over the next 20 years. The 1-inch walls are made from 215 layers of newspaper that were glued together using flour, water, and apple peels and sealed with a layer of varnish on the outside. 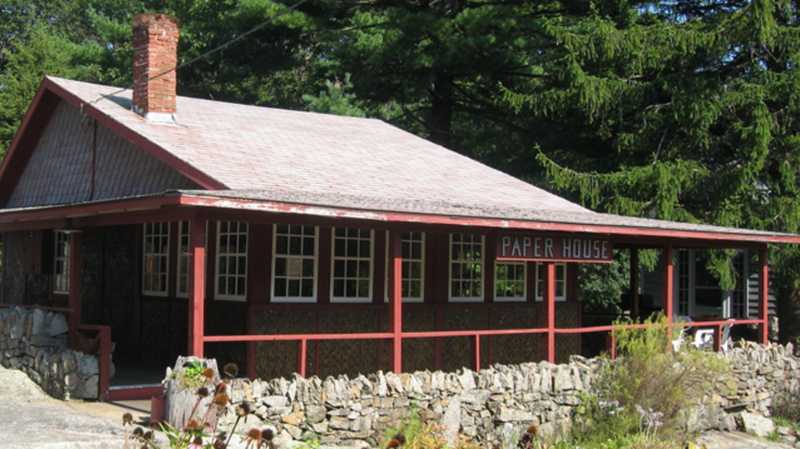 Besides being a quirky piece of architecture, the “Paper House” is also a monument to early 20th century history. The writing desk is made from stories related to Lindbergh’s transatlantic flight, and the radio cabinet displays coverage of Herbert Hoover’s presidential campaign. On the grandfather clock guests will find mastheads from the capital city newspapers of what were, at the time, all 48 states. Stenmen passed away in 1942, and the Paper House has since fallen under the care of his grandniece, Edna Beaudoin. It’s open to visitors every day from 10 am to 5 pm during the spring, summer, and fall seasons. Admission is $1.00 for children and $1.50 for adults, which is a whole dollar less than an issue of The New York Times.